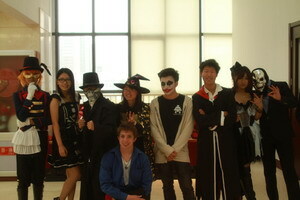 On October 31, 2013, the international department of Beijing No.80 High school held its first Halloween costume party, and all teachers and students took an active part in the activity. Halloween can make the students know more about foreign culture and traditional customs, strengthening the affection and communication among students. Students got dressed in the costumes of all kinds of strange characters, attracting the attention from everyone and also winning the applause. Two models from each class first had a fashion show, and according to their own role, they posed a variety of actions. They were really beautiful and handsome and they set off the first upsurge. Next was the dance part. Before the event, everyone was very positive and practiced the dance steps. People who did not participate in the dance or the games were talking to each other. The whole atmosphere was very happy. Everybody met a lot of new friends, and this activity was very meaningful.